We are excited to be going to Scotland for the first time! 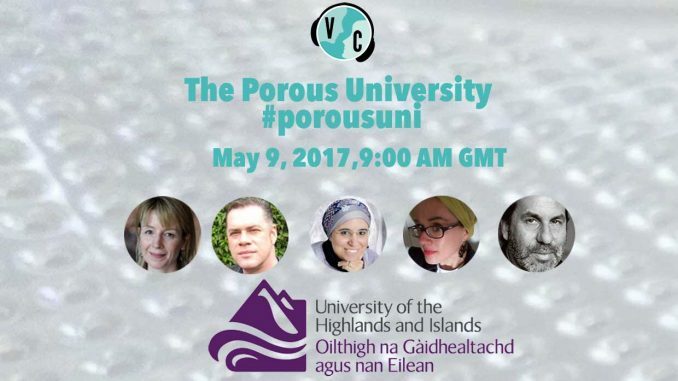 On Tuesday, May 9th, we are Virtually Connecting at The Porous University – A critical exploration of openness, space and place in Higher Education, which takes place May 8-9 at the University of the Highlands and Islands in Scotland. There will be no formal presentations or papers. Instead the symposium will be structured around a number of short provocations that address specific questions or issues, followed by break-out discussion and opportunities to further explore and synthesise the thinking that emerges. See the details about this event or view the details of the programme. Our session will take place on Tuesday, May 9th at 9am UK time, with featured guest Keith Smyth, Professor of Pedagogy, University of the Highlands and Islands. Onsite buddy Sheila MacNeill will also bring in other guests (TBA). To join the session, leave a comment here or send us a Direct Message on Twitter (@vconnecting). We will ask for your email address so we can send you a link ahead of the event. If you can’t join us live, or would like to just watch, you can watch the embedded YouTube below live or see the archived recording later. Part of what makes VConnecting special is the spontaneity – onsite guests may have to join us a little later than scheduled or leave early.